On April 24, 1981, Carl Perkins, Johnny Cash and Jerry Lee Lewis made an unscheduled rendezvous in Böblingen, near Stuttgart, West Germany. Touring Europe together, Perkins and Jerry Lee happened to have a night off on the very evening Cash was appearing in concert; at Cash’s urging, the three former Sun labelmates made a trio event of the show, running through some of the songs that had made each of them famous and a few other chestnuts that had influenced them in their youth. Tape was rolling, and a year later Columbia released the trio’s 12-song set at The Survivors Live, produced by Rodney Crowell. The band included Earl Poole Ball on piano, Marty Stuart on guitar and mandolin, Jerry Hensley, Kenneth Lovelace and Bob Wootton on guitar, Jack Hale Jr. and Bob Lewin on trumpet and French horn; W.S. Holland on drums and Henry Strzelecki on bass. 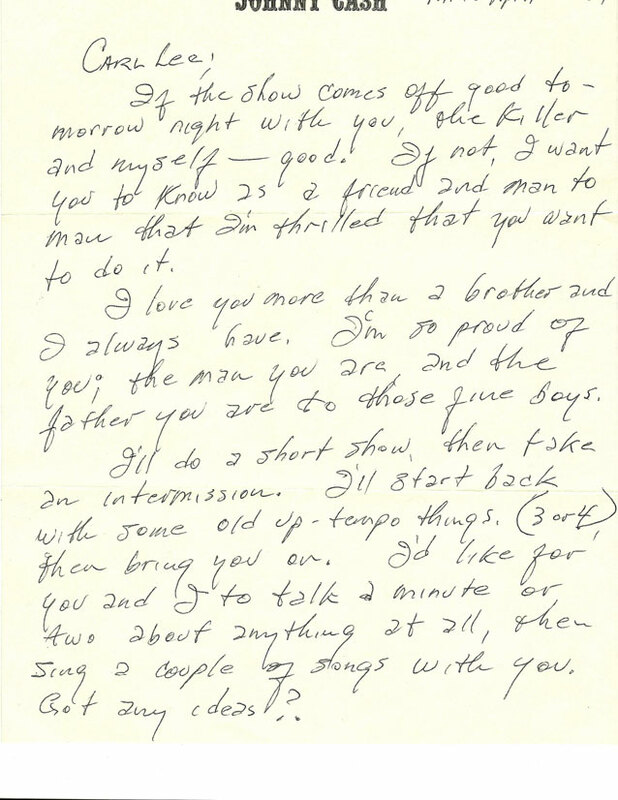 Writing to Perkins from Paris on April 23, Cash outlined a suggested set and added some personal comments that indicate the depth of his feelings for the man he loved ‘more than a brother,’ both having come from poor southern sharecropper families and having grown up practically across the Mississippi River from each other, Cash in Dyess, AK, Carl in Tiptonville, TN. 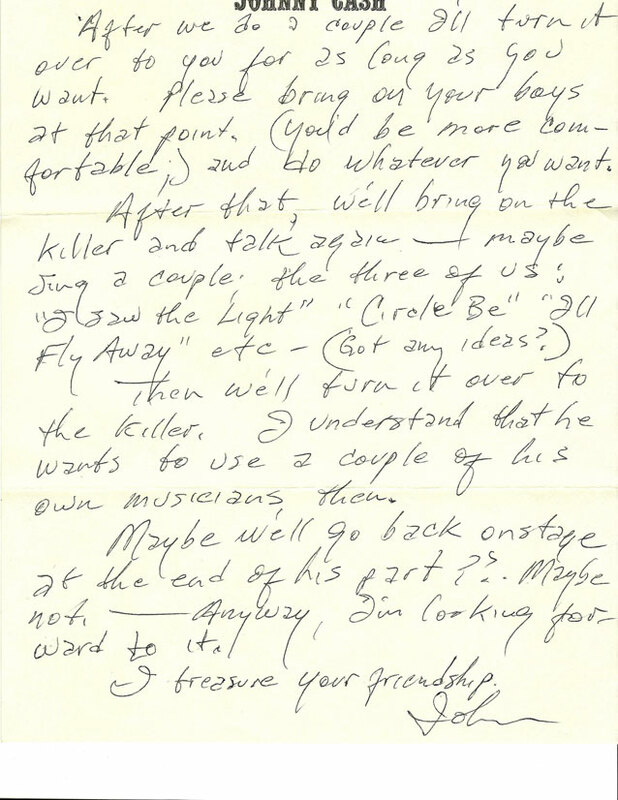 This previously unpublished letter is from the private collection of David McGee, presented to him as a gift by Perkins following an interview session for McGee’s authorized biography, Go, Cat, Go! The Life and Times of Carl Perkins, The King of Rockabilly (Hyperion, 1996). If the show comes off good tomorrow night with you, the Killer and myself–good! If not, I want you to know as a friend and man to man that I’m thrilled that you want to do it. I love you more than a brother and I always have. I’m so proud of you; the man you are and the father you are to those fine boys. I’ll do a short show, then take an intermission. I’ll start back with some old up-tempo things. (3 or 4), then bring you on. I’d like for you and I to talk a minute or two about anything at all, then sing a couple of songs with you. Got any ideas? After we do a couple I’ll turn it over to you for as long as you want. Please bring on your boys at that point. (You’d be more comfortable) and do whatever you want. Then we’ll turn it over to the Killer. I understand that he wants to use a couple of his own musicians then. Maybe we’ll go back onstage at the end of his part? Maybe not–anyway, I’m looking forward to it!